Mendelssohn’s piano trios are a most remarkable pair. They are like two beautiful sisters, probably more alike than you would expect from two works separated by six years. Even so they still make for great listening when played one after the other. The opening movement of the first trio is a model Romantic Allegro, with an ecstatic inrush. This is the charge and passion we associated with Schumann. The mood, with its dark triumph, is similar to the opening of the Kreutzer sonata. The slow movement is a beautiful romance. The piano states the love theme, which is then joined by the strings. There is much tenderness and warmth. The middle episode is more agitated and troubled; its colors are cooler and darker. This movement is followed by a light, elfin scherzo one would expect from Mendelssohn: mercurial, mischievous, with the flutter of little transparent wings, with filigree piano and hopping violin. The finale starts as a cheerful dance, half-polka half-waltz, but tempestuous piano flourishes return us to the turbulent world of the first movement. This could be the best example of a High Romantic piano trio, and it’s hard to beat it in terms of memorable melodies. The musicians of the ATOS trio show from the first note what they are up to. The gestures are wide and well-articulated, the accents are strong, and the flames are high. A good balance is struck: the music is less piano-centric than it appears in some other recordings. The cello is juicy and deep, deep, deep. There is expressivity, but it is noble, as it should be with Mendelssohn: nothing is over the top, the feelings are grand yet believable. In the slow movement, the ATOS choose a cozy, comfortable tempo, and are very expressive. Their middle episode is powerful and almost ecstatic – I do not feel the cooling down there. This performance underlines all the sweet curves of the gorgeous melody, infusing it with calories and saturating the senses. The reading might even be a little too syrupy. In the Scherzo, the light-fingered pianist is very agile. The performance is sparkling, swift and full of good humor. The ATOS start the finale with caution, and play it with enthusiasm, transparency and drive. The music just rushes forward. The ending is exuberant. If the first trio sounded remarkably Schumann-like, the more refined second trio is closer to Brahms. The first movement starts windy and foggy, and the cold rain beats at your face. There is a resemblance with the opening movement of Mendelssohn’s Violin Concerto: similar dramatic turbulence and heated yearning. Actually, at times it sounds like another violin concerto, with the supporting part reduced to piano and cello. In the middle of this storm there are hushed and tender pages of pastel tones and soft suspense. The coda is a Romantic rollercoaster. The slow movement is again a romance, softly rocking, lyrical and passionate. The temperature gradually rises; the music reaches an expressive climax, and then recedes to serenity. The third movement is another Mendelssohn Scherzo, though this time it is fussy and has more weight. The Trio has the cheerful stomp of a rustic dance. The finale is a serious, but joyous waltz, with the sweeping gestures of a Brahms Hungarian Dance. The movement has an interesting structure. One theme is more agitated and bouncy, the other more moderate and noble. Some moments may at first seem banal, but still they are very good. The ATOS trio demonstrates excellent ensemble. In the first movement they are not dry, yet not sloppy either. They also balance well the warm and cold colors on their palette, thus creating a feeling of richness. The slow movement is unhurried and keenly felt, although it seems to be cooking on a low fire. The Scherzo has an excess of piano in the mixture, so the result might sound heavy, especially when played fast. That’s probably why the ATOS players do not hurry too much, and so the texture gets some welcome transparency. Their finale is really diverse and embossed. The tempo and dynamics are well chosen. The piano’s part is dense, but Thomas Hoppe’s playing is very clean. The cello has a good weight, and the violin is very expressive. They play with excellent drive, and their ending is ecstatic. On the whole, I am very happy with this disc. 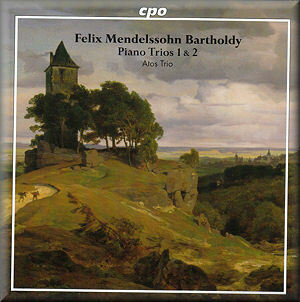 The two piano trios of Mendelssohn are two intensely beautiful works. The problem is that they are so much alike, structurally and musically. In really good performances this becomes an advantage, not a drawback. The ATOS trio gives us a powerful interpretation which is not inferior to the best “standard options”. It can be recommended as a disc to own, if you want only one recording of these works. The recording quality is very good. This is great music, and the presentation is worthy of it.